After the stoning of Stephen, there was a great persecution (per suh KYEW shun) of the Christians in Jerusalem. Saul went from house to house and dragged men and women off to prison if they were followers of Jesus. The Christians ran away from Jerusalem so they wouldn't be arrested and killed. For some reason, the apostles were protected and were able to remain in Jerusalem without being arrested. Philip, in our story, was not the apostle Philip, but he was one of the seven men who had been chosen to help take care of the widows in Jerusalem. He too, left Jerusalem and went to the district of Samaria. One day an angel told Philip to go south on a certain road that went from Jerusalem to Gaza, which was near the coast of the Mediterranean (med it ter ANE ee un) Sea. As he went, he met a man from the country of Ethiopia (ee thea OH pea uh). The man was riding in a chariot. He was an important person in the government of his country. Candace (can DAY see), the queen had put him in charge of the country's treasury; all their gold, silver, and wealth. He was a believer in God and had been to Jerusalem to worship. He was probably not a Jew, but a proselyte (PROS uh lite), a person who had accepted the Jewish religion by going through certain acts such as baptism. When a person became a proselyte, he/she was taught about the Jewish laws and given a Jewish name. 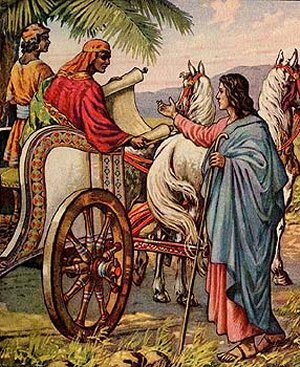 Philip went near to the chariot. The man was reading from the book of the prophet Isaiah. "Do you understand what you're reading?" he asked the man. 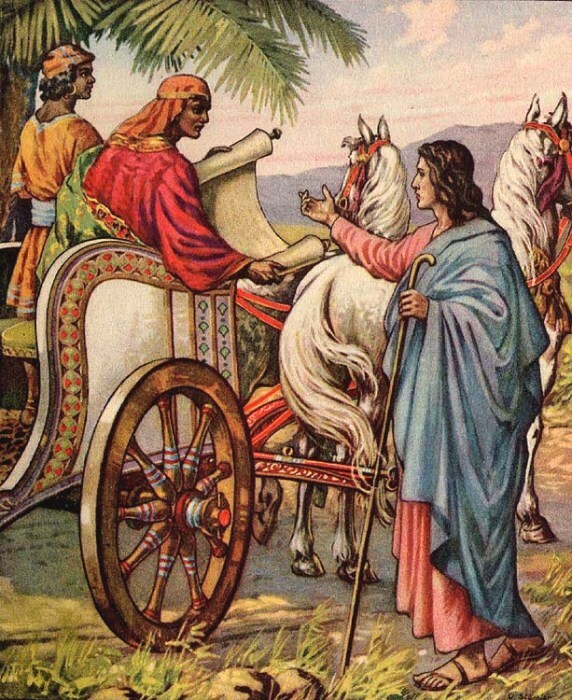 The man said he needed someone to explain it to him, and he invited Philip to sit in the chariot with him. Then they continued on the journey. The scripture he had been reading had been written more than 500 years before, and was a prophecy in the book of Isaiah about a man who was going to be unfairly tried and judged, but that man wouldn't try to defend himself. The Ethiopian asked, "Is the prophet writing about himself or someone else?" Philip started at that very scripture and told him the good news about Jesus; how he had come to earth, been killed and how that God had raised him from the dead. And evidently, he also had talked about baptism because when they came to a body of water, the Ethiopian said, "Look, here is water. Why shouldn't I be baptized?" He ordered the chariot driver to stop. Philip said, "If you believe with all your heart, you may." The man said, "I believe that Jesus Christ is the Son of God." Both Philip and the Ethiopian went down into the water, and Philip baptized him. When they came up out of the water, the Spirit of the Lord suddenly took Philip away. We don't know if he was suddenly transported to another place, or if he was just instructed to go to the next place. Anyway, the Ethiopian never saw him again. As for the man in the chariot, he was so happy! He went on his way rejoicing, knowing that now he had this wonderful relationship with Jesus and God, the Father. One lesson we learn from the story of the Ethiopian is to always look for the truth. He was honestly trying to find out what God wanted him to do. God recognized his honest heart and sent someone to teach him. If you truly want to do the right thing, God will help you. You may meet a person who can counsel with you and guide you, or circumstances may just "work out" so that you can serve Him obediently. But the initial choice is yours, and you need to keep your heart soft and receptive so that God can work in your life. English Bible Activities Select story #251 in the list for activities to accompany this Bible story. Spanish Bible Activities Select story #251 in the list for activities to accompany this Bible story. Press "Go" to search for books about Philip. This page displayed 105,651 times.